The 5 mobile credit card machines listed below make it easier than ever for UK small businesses to accept card payments almost anywhere without the need for a dedicated PDQ machine, merchant account, expensive PDQ machine rental contract or any other hassles that come from more traditional payment processing companies. This can be great for small businesses just getting started. But the trade-off is that they often charge higher fees compared to dedicated payment processing companies, usually do not offer the flexibility of accepting card payments online or over the phone and may not look quite as professional as regular PDQ machines. Therefore, while you should definitely have a look at all the companies below, you should also consider comparing card reader companies using our form at the top of the page as well. 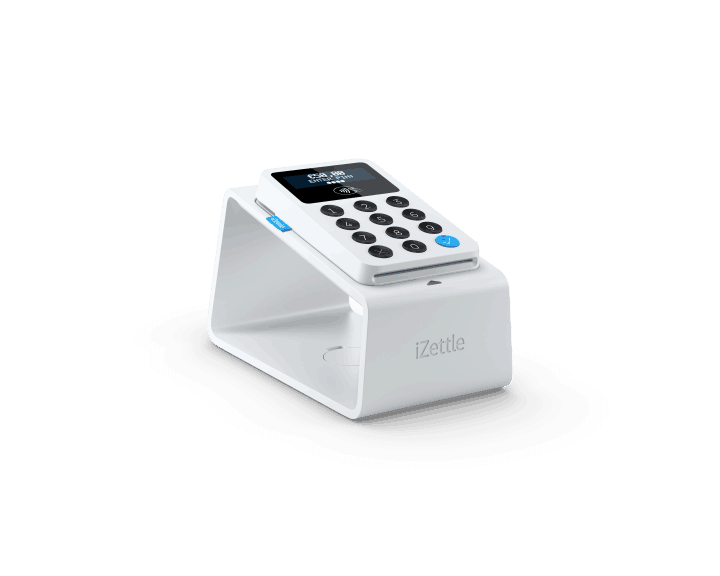 The iZettle card reader has quickly become one the most popular mobile credit card machines options for UK small businesses. 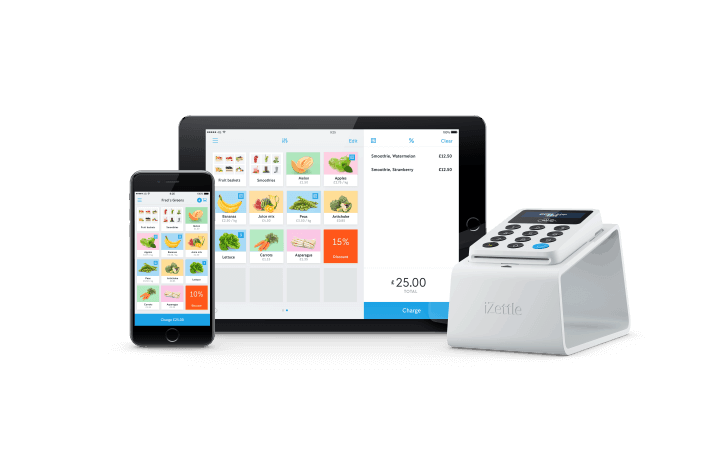 Below we outline the major pros and cons of the iZettle system, but for a more in-depth look have a look at our complete 2019 iZettle review. Accepts chip & pin, contactless and magstripe payments – including Apple Pay and Samsung Pay. Contactless card payments are up to 25% faster than other mobile credit card machines on the market. Transactions made by contactless cards below £30 are approved within seconds. Charges via USB cable or through the dock (purchased separately). Charge time: 1-2 hours. Battery lasts for up to 8 hours or 100 transactions. Can also be used to sell online via iZettle Ecommerce. While there have been a few versions of the iZettle card reader, the current one retails for £59 + VAT. However, for a limited time only you can get one for just £25 + VAT by clicking here Until 29 April 2019 now only £19 + VAT by clicking here. This makes the iZettle card reader one of the most competitively priced in UK market at this time. iZettle now only charges a flat 1.75% fee per transaction. Previously, its transaction fees were charged on a sliding scale. Merchants with low payment volumes were charged 2.75% per transaction. This fell to as low as 1% per transaction for businesses processing more than £40,000 worth of payments per month. The minimum amount per transaction is £1 for all accounts with the maximum amount being £5,000 for Chip-card (incl. contactless) & PIN processed by business account holders. Overall, iZettle’s fees are among the lowest in the industry. However, you’re still advised to compare them against the other options below and normal PDQ machines. One of iZettle’s greatest selling points is that there are no set-up fees (beyond buying a card reader) and no monthly fees either for their regular GO account. This makes them an attractive option for new businesses and those that are unsure how much they’ll use their machine. However, they do offer a premium account called GO PLUS which costs £20 per month. Another major selling point for the iZettle card reader is the fact that you are not required to sign a contract, unlike most traditional merchant account providers. This means you can use them for as long or short a period as you like. The iZettle card reader requires the iZettle app (available for both iPhone and Android) to function properly. Beyond that there are a whole host of add-ons that can turn the card reader into a full fledged point of sale system. Overall, these add-ons greatly extend the functionality of the iZettle reader, but be aware the costs for some of the items may be more than equivalent price you’d pay for the same item on a standard EPOS system. Overall, the iZettle credit card machine is great option for businesses looking to get started taking card payments. While their fees are not the lowest in the industry they are very transparent and do drop as volume increases. Moreover, the fact you do not need a contract to get started and there are no ongoing costs besides transaction fees, makes iZettle a top choice when it comes to mobile credit card machines for small businesses. If you’re ready to give them a try, get started by visiting the iZettle website here. If you’d like to learn a bit more about them, read out full: 2019 iZettle Review – UK Card Reader Fees & Pricing Compared. Square is an American company and is the largest provider of mobile credit card machines and readers in the world. Although they’re still relatively new in the UK, they have quickly become the second most popular option among small businesses searching online. It was co-founded by Jack Dorsey who also co-founded Twitter and currently handles over £40 billion ($60 USD Billion) worth of payments globally each year. Below we look at the costs along with some of the pros and cons of using the Square Reader to handle your payments. Square lets you take chip and PIN cards, contactless cards and other mobile payments. See deposits in your bank account as soon as the next business day. Includes a a free point-of-sale app (Works on Apple and Android devices including both Smartphones and Tablets). To see all features visit the Square website. The Square Reader is slightly more expensive than the iZettle Reader, at just £29 + VAT, still making it very affordable. You can buy it directly on the Square website. You can also buy it on Amazon for £49.95 (includes VAT) but this is more expensive than buying direct. Square’s transaction fees are pretty much exactly the same as iZettle’s just 1.75% for chip & pin or contactless payments (for all cards including Amex). For keyed-in (e.g. phone orders), online or invoice payments they charge 2.5% due to the slightly higher risks involved. And unlike iZettle there are no minimum transaction value. So if you’re just going to use it as card machine, you’ll get one of the best rates in the market today with fewer restrictions. Beyond paying the £29 for the card reader and the transaction fees above, there are no other hidden or monthly fees from Square. However, like all the devices listed on this page you’ll need a valid data plan with your mobile phone provider. There is no contract required for using a Square Reader and no charges for inactivity. Of all the mobile credit card readers on this page, Square currently has the most to offer in terms of add-on features and functionality. Ability to use your iPad (or Android Tablet) to process payments, in addition to your smart phone. Inventory management via the App. Invoicing software that allows people to pay you via card online (2.5% rate applies). Virtual Terminal so you can take payments by phone or mail (MOTO payments) – 2.5% rate applies. Can synch with other apps and software you use for things such as accounting, analytics, e-commerce and more. While the Square Reader is the core payment processing product offered by Square, it’s more than just a simple card machine. 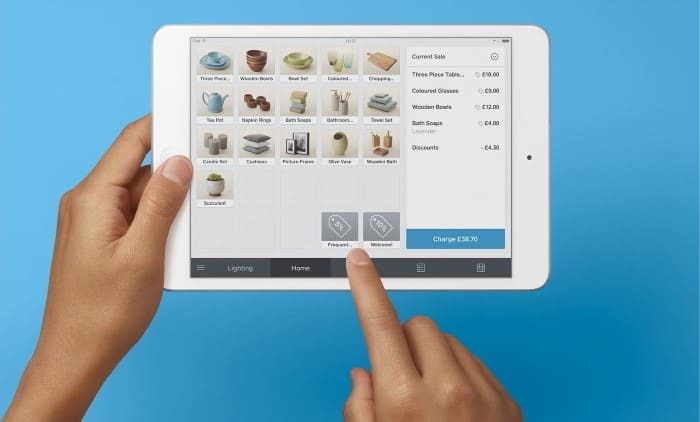 If you wanted to, you could use Square to manage payments across your entire business. However, the card reader itself costs a little bit more than iZettle. With their fees being identical, the real choice comes down to how many additional features you need. If all you need is a card reader and nothing else both iZettle and Square will do the job well. But if you need additional features Square likely has a few more. To get started with the Square visit their website here. SumUp is a dedicated, standalone credit card machine provider similar to iZettle. They also recently purchased payleven, which offered a similar product. While you can still buy payleven card readers at some retailers, our focus below is only on the SumUp Air card reader, since we suspect payleven devices will eventually be discontinued. SumUp’s major selling point is that it offers a simple, flat transaction fee. This is great for businesses that process low volumes of card transactions. However, for businesses that process a higher volume of payments it might not be the right choice. The SumUp Air card machine currently costs £59 + VAT. This is inline with iZettle’s normal card reader price, but more than double the current promotion price. It’s also higher than either PayPal Here or WorldPay Zinc’s card reader prices. SumUp’s major selling point is the low initial transaction fee of just 1.95%. This is the same as WorldPay Zinc’s fee, but with SumUp there is no monthly fee to get this rate. This makes them the second cheapest option for businesses that are unsure how much they’re going to be processing each month or businesses that process variable amounts per month (e.g. seasonal businesses). However, with iZettle’s new flat 1.75% transaction fee, SumUp is now only the second cheapest option. Similar to all the other companies featured here, there are no set-up (beyond buying a card reader) and monthly fees to use SumUp Air. You also get free delivery of your card reader, free Android / iOS app, free dashboard with reporting, and free telephone and e-mail support. You do not need to sign any long-term contract to use SumUp. 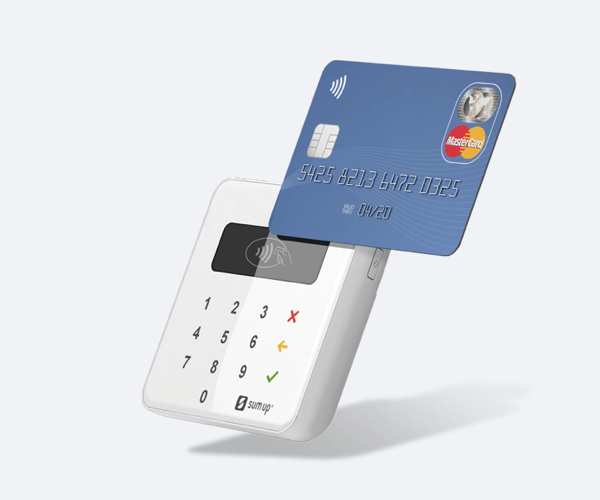 Unlike iZettle, SumUp does not offer official add-on products to extend the usefulness of their card reader. However, they do list compatible receipt printers that work with the SumUp Air. SumUp is currently the best alternative to iZettle for businesses, but their current transaction fees are now slightly higher. To get started with SumUp visit their website here. 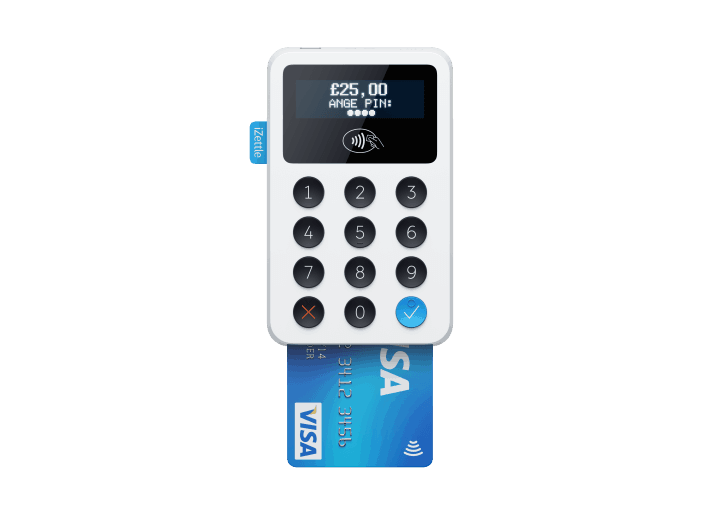 Or to learn more read our 2019 SumUp Review – UK Card Reader Fees & Pricing Compared. Paypal Here is PayPal’s mobile credit card machine solution. 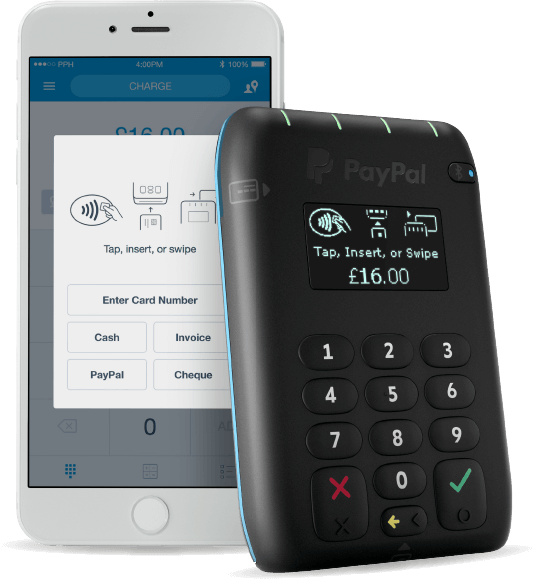 While not as competitively priced as the iZettle card reader, it does benefit from integration with PayPal, one of the best known names in online payments. Accept card and contactless payments without monthly fees. Payments reach your PayPal account in seconds. Works with Apple Pay and Android Pay. The PayPal Here card machine costs £75 including VAT (£62.50 exc VAT). This makes it marginally more expensive than the iZettle card reader’s normal price. PayPal Here’s transaction fees start at 2.75%. However, their fee structure is quite a bit more complex than iZettle’s or SumUp’s, with their lowest fee dropping to 1.5%, 0.25% lower than iZettle. To qualify for their Merchant Rate you need to process at least £1,500 worth of payments per calendar month. They then offer a Blended fee structure or an Interchange Plus fee structure. The differences between the two is not huge, which can make selecting the right even more difficult. Overall, iZettle offers lower fees at most monthly transaction levels. There are no set-up (beyond buying the card machine) or monthly fees for using PayPal Here. And if you already have a Paypal Business account you can get up and running right away. PayPal Here does not require a monthly contract. Overall, the main selling points of PayPal Here over iZettle are that it integrates with your PayPal Business account and may offer slightly lower fees. This allows you to manage online and offline payments in one place and helps get you up and running more quickly since you can apply and pay for your PayPal Here card reader using your PayPal Business account. In terms of features there’s not much to pick between the either company’s credit card machine. However, in terms of fees, iZettle’s are likely to be lower than PayPal Here at most transaction levels. Combine that with more a greater diversity of add-on products and a lower initial machine cost and iZettle looks like the more attractive option for businesses only interested in handling in-person card payments. WorldPay Zinc is WorldPay’s mobile credit card machine solution for small businesses. WorldPay is the UK’s largest credit card processing company and also offers a range of other credit card machines and merchant services for both offline and online payment processing. WorldPay Zinc’s one major advantage over the other credit card machines above is that it can be used to handle phone payments as well as in-person payments. However, the major disadvantage is that their keypad does not currently accept contactless payments. To process contactless payments with WorldPay, you’ll have to go for one of their full priced card machines. A secure Chip & PIN solution from the UK’s leading card payments company. Works with iPhone, iPad, Android phones & tablets. Take payments face-to-face or over the phone. At the time of writing, the WorldPay Zinc Chip & PIN Keypad is only £39.99 (incl VAT). It has previously sold for as much as £79.99, making it more expensive than iZettle’s current promotional price, but roughly in-line with both iZettle and PayPal Here in terms of cost. WorldPay Zinc has two pricing options in terms of fees. The first is 2.75% per transaction with no monthly fee. The second is 1.95% per transaction if you pay £5.99 a month. This means your fees with WorldPay Zinc could be lower the same as SumUp or higher than iZettle. Similar to the other companies above, there are no set-up fees (beyond keypad) with WorldPay Zinc. However, there is an optional monthly fee of £5.99 per month, which drops your transaction fee from 2.75% to 1.95% (see above). Neither, WorldPay Zinc fee structure requires any commitment or long-term contract. For the WorldPay Zinc card reader to work, you’ll need to download their free app. They also offer the WorldPay Zinc online portal where you can process phone orders. However, they do not have an official list of additional hardware you can use to extend the card reader. But, they do state you can connect a Bluetooth printer to your phone and print receipts. 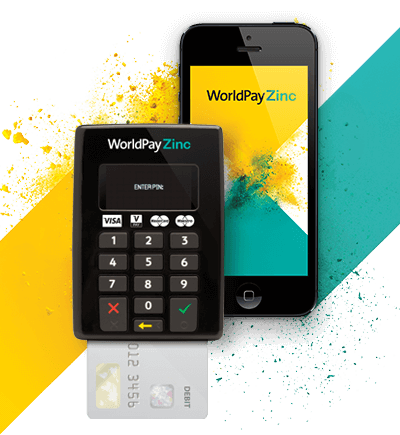 WorldPay Zinc is a very stripped-down mobile credit card machine solution, presumably because WorldPay does not wish to compete with its higher margin, traditional PDQ machines. Nevertheless, WorldPay Zinc may be a good solution for small businesses processing less than £5,000 per month in card transactions and who don’t need to accept contactless payments. It may also be a good solution if you take payments by phone and in-person but not online. SmartTrade App is different from all the solutions above since it’s aimed at tradespeople and does not even require a card reader. Instead you just scan your customer’s debit or credit card with your smartphone. It also offers 3 different payment options: Face-to-face, over the telephone or through emailed paylinks. In another twist, they offer you the ability to pass on your card fees to your customer so you in effect pay nothing. However, all these features do come at a cost since their fees are generally a bit higher than some of the competing products above. You can learn more below. Since you don’t need a credit card machine to use the SmartTrade App, you don’t need to pay anything upfront. They also offer a 30 day free trial of their service. The fees to use SmartTrade App vary from 2.15% + 20p Credit card fees to as low as 1.75% + 20p Credit card fees depending on the plan you choose. While the percentage taken is lower than some competing products, keep in mind you also pay 20p per transaction, no matter the size. So if you process a lot of very small transactions this could really add-up. They also offer a 0% per card transaction option whereby you roll all the fees onto your customer’s bill. You can cancel your contract at anytime and you get the first 30 days free. SmartTrade App is a standalone product so does not offer much in the way of add-ons. It does allow for easy integration into accounting packages like Xero and Quickbooks. You can also access the app on any Apple or Android Device or online through any web browser. They also offer a web dashboard to manage all payments, invoices, and quotes. The SmartTrade App makes sense for tradespeople who don’t want to bother with a credit card machine, those who want to be able to accept payment by phone or those who want a zero fee card payment option. However, their per transaction fee and monthly plans mean, it may not be right for all merchants, only those who process relatively few, high value transactions. To learn more about SmartTrade App visit their website here. PayPal Here: Best for online integration with PayPal. WorldPay Zinc: Good for those who need to accept phone payments or those who want to work with an established brand in the payment space. Apply to Zinc here. SmartTrade App: Best for those who don’t want a card reader or those who don’t want to pay any fees. try the SmartTrade App Here. The rankings above are based on monthly online searches, and do not reflect the quality of the products themselves. Note: We have partnership agreements with iZettle, Square, SumUp, Worldpay and SmartTrade App. They each pay us a commission if you sign-up and start using their services. We genuinely think they offer great mobile credit card machines and processing solutions for UK small business, but we leave the final judgement up to you.